In 19th Century Java, a brutal massacre and the murder of Sultan Hamza by Captain Van Trach and his Dutch soldiers force Arana, Jamar and Suwo – the sultan’s brother and infant sons – to flee the country, bringing them halfway around the world to the American Wild West. 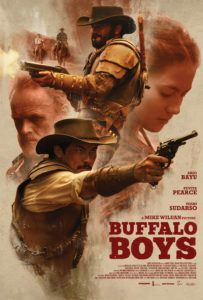 After working the railroads and learning the cowboy way of life, Arana tells the boys it’s time to return to their homeland and avenge their father’s death. Back on Indonesian soil, the hunt for their father’s killer begins. Along the way, they meet some villagers including Kiona, the rebellious and beautiful headman’s daughter who Suwo falls for, and soon find out that the treacherous Van Trach still rules the area. Their presence puts the village in danger, quickly turning their quest for revenge into a fight for freedom. With the odds stacked against them, Arana, Jamar and Suwo use the skills they learned from the wilds of America to face Van Trach and his army in a showdown for justice.